This section consists of various projects, with a focus on technology applications, which demonstrate the advanced functionality of Meep and MPB. Refer to their homepages for an introduction to each software package including descriptions of features and Python user interface as well as tutorials demonstrating basic functionality. Each project consists of a Python simulation script, a shell script to run the simulation, and Python post-processing routines for visualizing the output. A version of this page is available for the Scheme user interface. 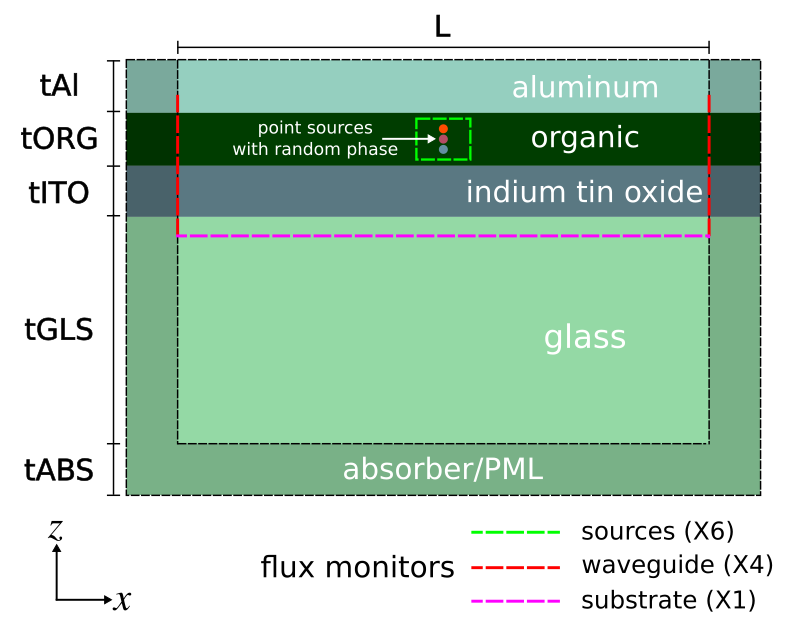 A typical device structure for a bottom-emitting OLED is shown below. The device consists of a stack of four planar layers. 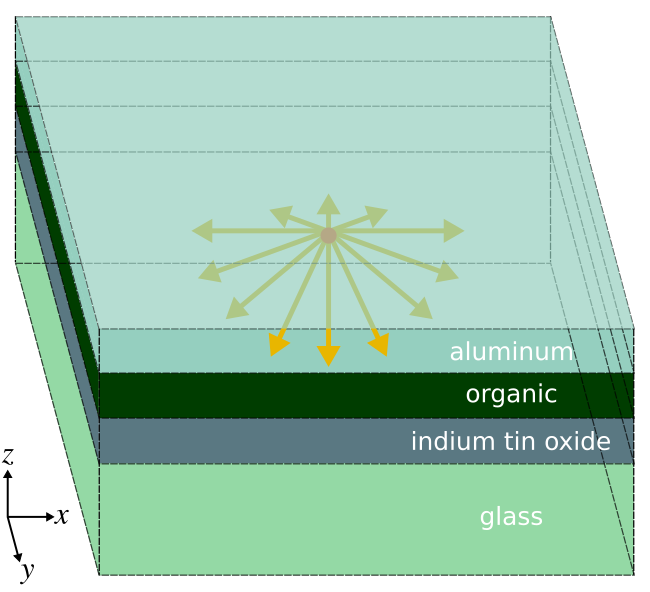 The organic (ORG) layer is deposited on an indium tin oxide (ITO) coated glass substrate with an aluminum (Al) cathode layer on top. Electrons are injected into the organic layer from the Al cathode and holes from the ITO anode. These charge carriers form bound states called excitons which spontaneously recombine to emit photons. Light is extracted from the device through the transparent glass substrate. 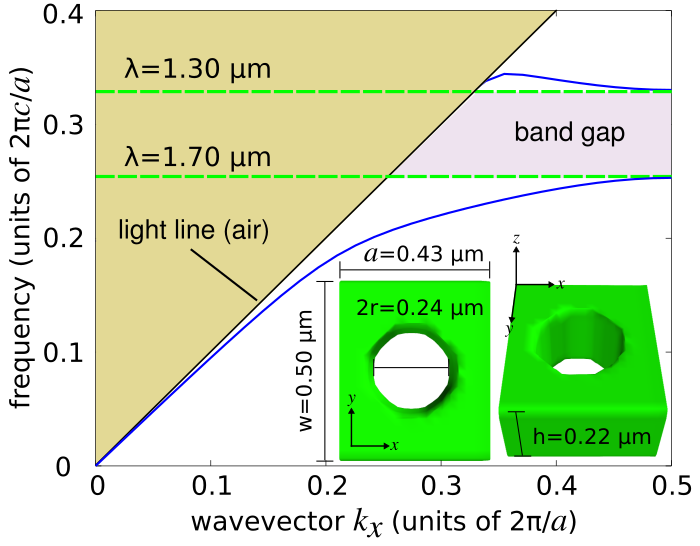 Some of the light, however, remains trapped within the device as (1) waveguide modes in the high-index ORG/ITO layers and (2) surface-plasmon polaritons (SPP) at the Al/ORG interface. These losses significantly reduce the external quantum efficiency (EQE) of OLEDs. We compute the fraction of the total power in each of these three device components for broadband emission from a white source spanning 400 to 800 nm. The results can be obtained using a single finite-difference time-domain (FDTD) simulation. The first component of any Meep simulation script is the importing of the Python modules. All examples involve command-line parameters which require the argparse module. This example also involves complex (cmath) and random (random) numbers. We use a set of point-dipole sources, each with random phase but fixed polarization, distributed along a line within the middle of the organic layer. The number of point sources is a parameter with a default of 10. The polarization of the source has an important effect on the results which we will investigate. Instead of using a random polarization, which would require multiple runs to obtain a statistical average, the sources can be separated into components which are parallel (directions X and Y) and perpendicular (Z) to the layers. Thus, we will need to do just two sets of simulations. These are averaged to obtain results for random polarization. We can also exploit the two mirror symmetry planes of the sources and the structure in order to reduce the size of the computation by a factor four. The phase of the mirror symmetry planes depends on the polarization of the source. Finally, since only the source and not the structure is being changed between runs, we can store the epsilon in the first run as an HDF5 file and load it back in during subsequent runs. This speeds up the calculation by forgoing subpixel smoothing which is time intensive. An input parameter load_structure specifies whether to load the structure from file or save the geometry to file. Finally, with the structure and sources set up, the fields are time stepped until they have sufficiently decayed away due to absorption by the absorbing boundary layers or surface plasmons. Afterwards, the fractional power in each of the three device components is computed from the flux data. The results are written to standard output as four columns separated by commas. The first column is the wavelength. The last component of the script involves specifying the command-line parameters and their default values. This takes about 3 hours to run on an Intel Xeon 2.60 GHz machine. Once the simulation is complete, we plot its output using a Jupyter/IPython notebook. The total power in each device component is the sum of the relevant columns of the output. The first thing to do, as before, is to load the necessary Python modules. The first component of the simulation script, as always, is the importing of the various Python modules. 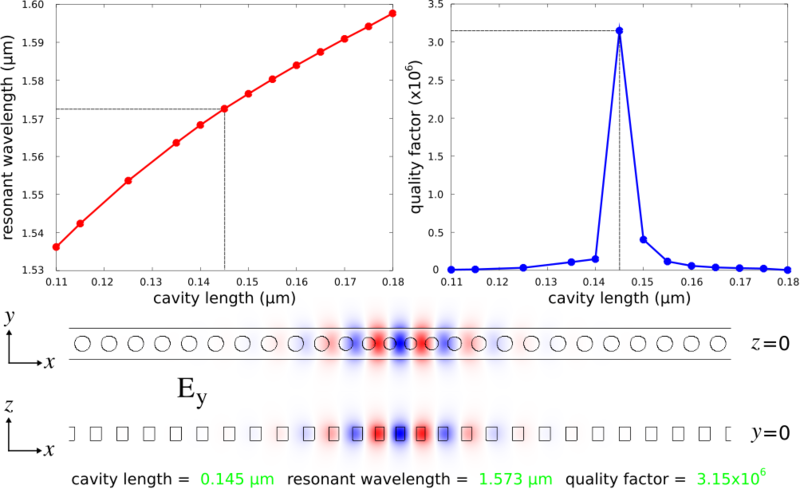 One-dimensional photonic-crystal waveguides consisting of a periodic array of cylindrical holes within a silicon slab of rectangular cross section are found in a wide range of applications involving lasers, optomechanics, and quantum optics. An important feature of these structures is that they can support cavity modes with low losses having quality factors typically exceeding 106 (as demonstrated in the next section) and are simpler to fabricate than their 2d or 3d counterparts. 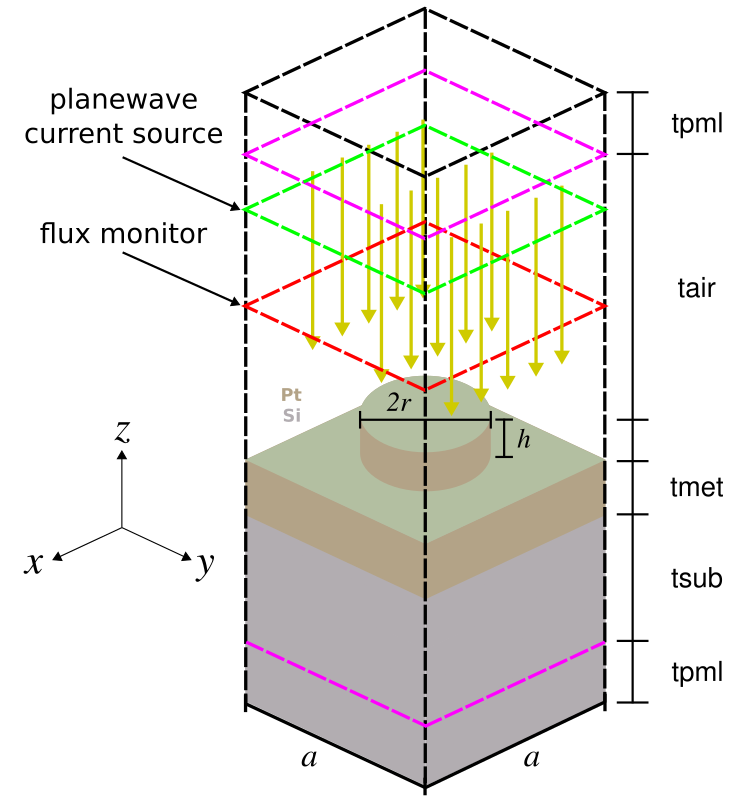 We will use MPB to compute the dispersion relation of a 1d photonic-crystal nanobeam waveguide based on the design in Applied Physics Letters, Vol. 94, No. 121106, 2009 (pdf). 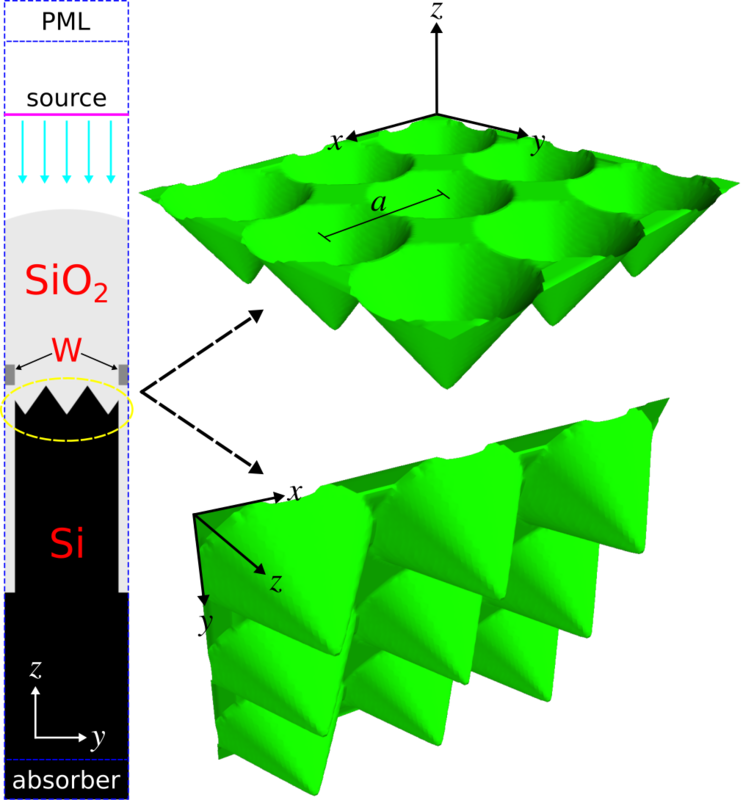 This structure can be fabricated using an SOI wafer. r = r/a          # units of "a"
h = h/a          # units of "a"
w = w/a          # units of "a"
Finally, we plot the results using matplotlib. We will create a Bash shell script to run three simulations for each lattice design: (1) the empty cell with just the source, (2) the flat substrate, and (3) the textured substrate. The lattice periodicity (a) is varied over the range of 0.40 to 0.70 μm. The simulation output is piped to a file for post processing in Python. The following are the shell launch script and plotting script. 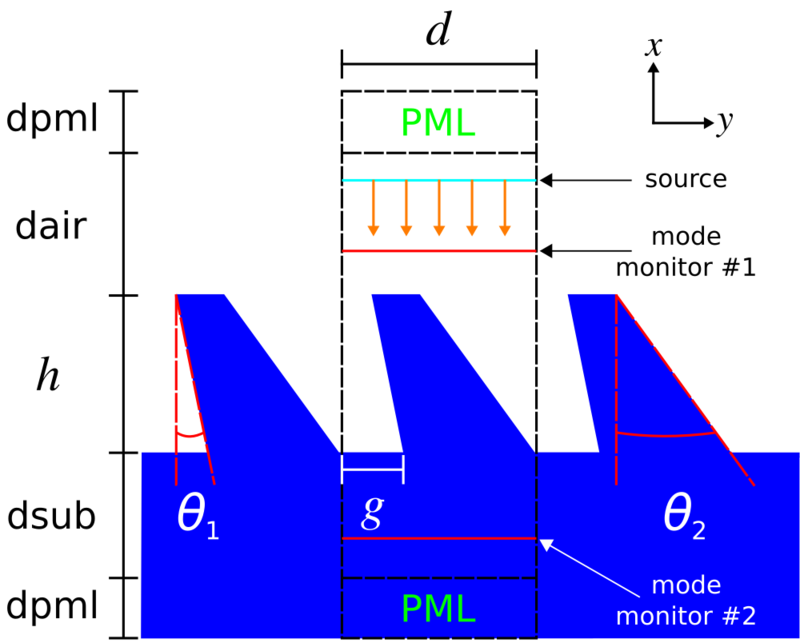 The asymmetric grating design, shown in the schematic below along with the overall simulation geometry, is based on Optics Express, Vol. 15, pp. 2067-74, 2007. The unit cell has five degrees of freedom: periodicity (d), height (h), gap (g), and two angles for the side walls (θ1 and θ2). These have arbitrary default values of 3.5 μm, 1.9 μm, 0.7 μm, 12.8°, and 27.4°. The grating material is episulfide with a wavelength-independent refractive index of 1.716. 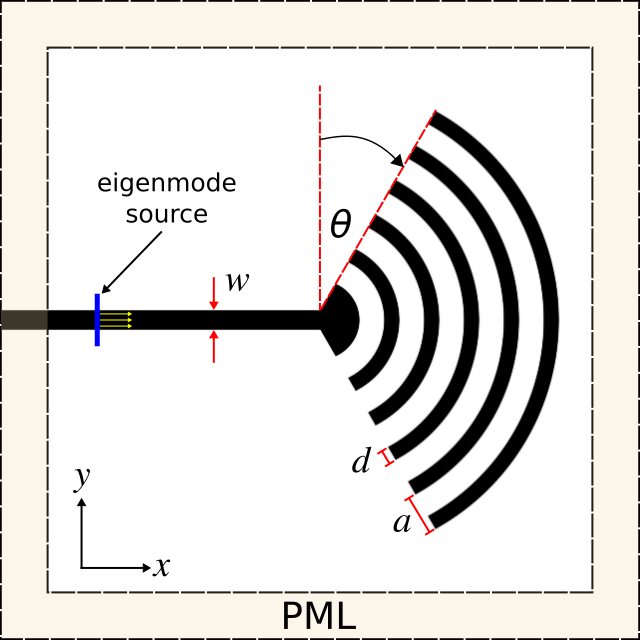 A planewave pulse centered at 0.5 μm is incident from the air region above the grating. The planewave's angle and polarization are specified using the src_angle and src_pol command-line parameters. Two mode monitors are used to compute the reflectance and transmittance of the diffracted orders via mode decomposition. Note that for any polarized planewave at normal incidence, the asymmetric grating yields diffraction orders which are either even or odd. To separate these modes in the output, we must invoke get_eigenmode_coefficients twice with its eig_parity parameter set to EVEN_Y or ODD_Y. The reflectance and transmittance of each diffracted order is output on separate lines, including its angle, prefixed by refl: and tran:. At the end of the simulation, the total reflectance and transmittance are output on the line prefixed by total:. 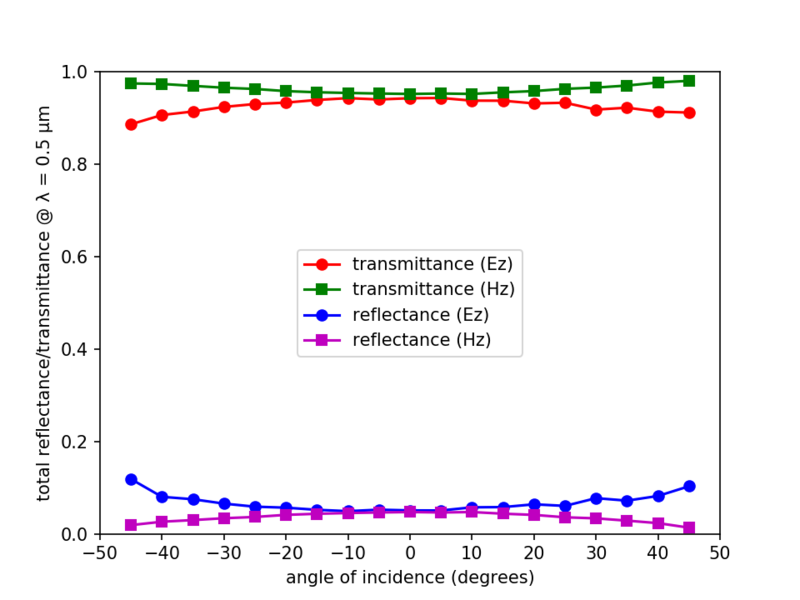 The Python script below plots the reflectance and transmittance spectra.